Recent days I have been exploring varieties of vazhaipoo recipes ( Plantain flower/Banana flower in English) in my kitchen. Most of the South Indians especially Tamil people make Vazhaipoo vadai and Vazhaipoo paruppu usili using this vegetable and it would be their favorites as well. Me too not an exception. 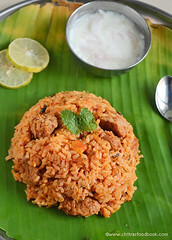 But apart from these usual recipes, I wanted to try some interesting and unique recipes with vazhaipoo. 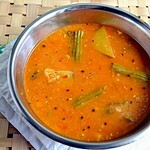 As a result of which I have tried and posted Vazhaipoo Kuzhambu / Banana flower gravy and Vazhaipoo dosa recipes in my blog. 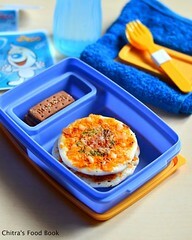 Here comes yet another yummy, kids friendly snack with banana flower. Yes, Its Vazhaipoo Kola urundai i.e Spicy fried plantain balls. 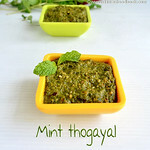 I found this recipe in Nalini’s blog and I have tried it thrice so far. 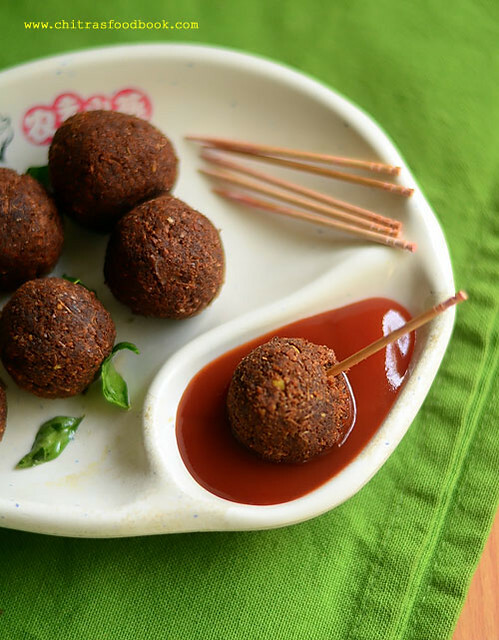 Once I made these balls for preparing Vazhaipoo kola Urundai kuzhambu ( Will post the recipe soon) for our lunch and made the same twice for my daughter’s evening teatime snack. 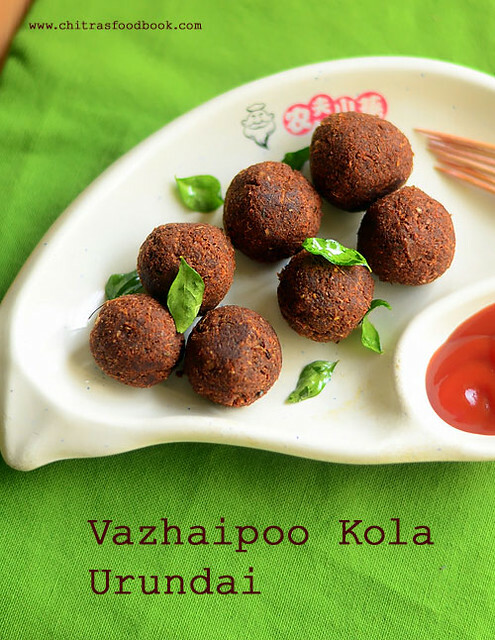 This vazhaipoo kola urundai is sure a welcome change from vazhaipoo vadai. 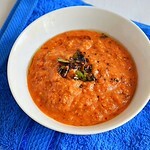 It can be made instantly without soaking dals. But it tastes crispy and the best only when hot. 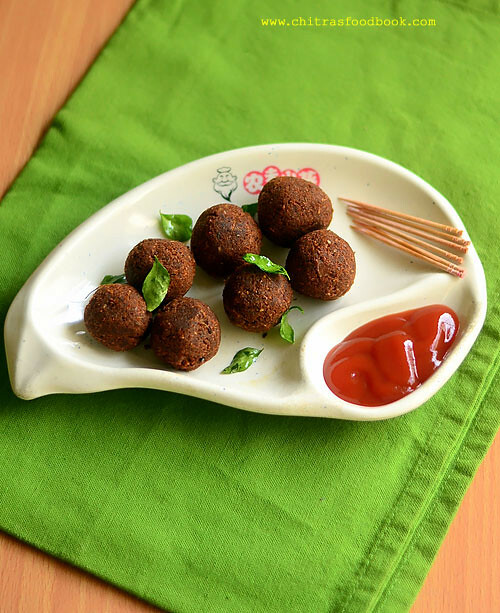 My daughter Raksha likes to relish these balls with her favorite tomato ketchup. Friends, do try this healthy snack with banana flower for your kids when they come back from school. I am sure they will love it a lot. Ok, Now lets check how to make Vazhaipoo kola urundai with step by step photos ! 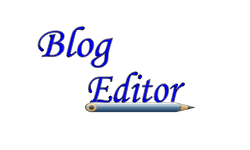 Remove the florets from the banana flower and set aside. Remove the Kalan(black colored stamen) from the florets and soak the florets in water or buttermilk till use. Pressure cook the banana flower adding little water in high flame for one whistle. Drain the excess water, squeeze it and remove from the cooker.Grind them in batches in a dry mixie jar. You should wipe the sides of jar every time for proper grinding. (I din’t cook the banana flower. I ground them directly as raw florets) Once the florets are coarsely ground, add the red chilli powder, grated coconut, fennel seeds, salt, g&g paste and big onion. Grind everything nicely to a smooth paste. Add 1 tbsp of water if necessary while grinding. In another mixie jar, powder the fried gram dal and set aside. Take the ground batter in a wide plate.Add the powdered fried gram dal and rice flour. Mix well without adding water. 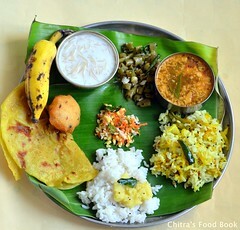 Fried gram flour and rice flour absorbs the moisture content in the banana flower mixture and becomes dry. Make small balls out of the dough and arrange it. Add more chilli powder based on your taste. Check for salt & spice and adjust them while mixing the dough. 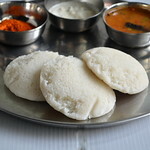 Try to grind the vazhaipoo mixture to a smooth paste without adding water. At worst case, you can add 1-2 tbsp. 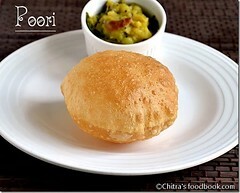 If the dough is sticky and too wet, add more fried gram dal flour and little rice flour to adjust the consistency. Try this snack with banana flower for a change and enjoy ! Hi, its the nature of flower you bought. 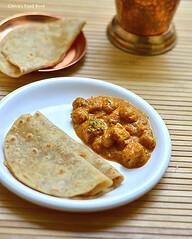 U can try adding some lemon juice and more besan flour. Hope it works.